You proly know "Shadowcat" is my brother; he has a account on here with that name. But what a coincidence..
Well I knew Shadowcat was a person on here. Did not know he was your brother though. Liked this one more then the first and really feel they tightend it up quite a bit. Also feel like they set it up for a third game and kinda excited. This may have been my favorite game this year if Pokemon Sun/Moon didn't come out already. This is the first game I've kickstarted that I have received a code for. Honestly, I'm shocked to say it was worth the wait. Much throughout the game, I lamented that this game wasn't as good as Pirate's Curse. I beat it considerably faster, writing/jokes was not as strong as previous entries, and many of the transformations felt like extras. Despite this, I could not stop playing this game. Even when I beat this and went "screw this game" after the final level, I picked it up an hour later and found myself having fun do my trophy hunting and other wrap up. I'm even doing a speedrun play-through with a new mode I unlocked. I never do those! This is also one of the strongest OSTs for the series as well. Despite it's faults, I really came to love this game. I may even write a review of it next year. If you are wanting to play a very entertaining platformer, you can't really do better this year. But, if you say Pirate's Curse was better, I can't say your wrong. Heck, play both. 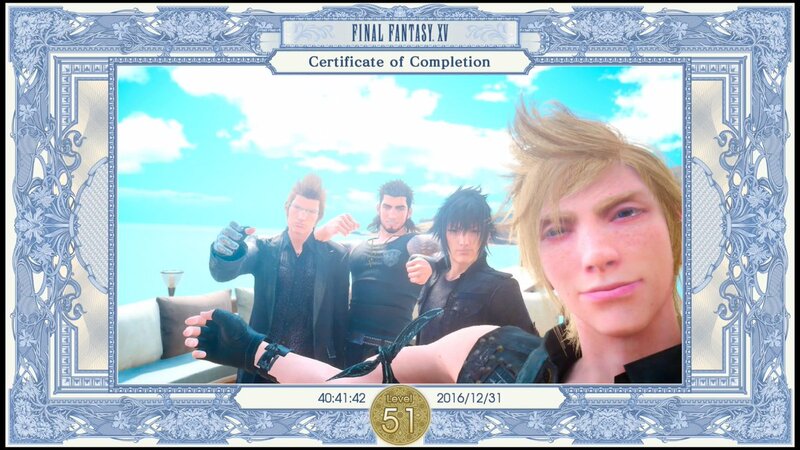 I also beat Final Fantasy XV (PS4) tonight! Enjoyed it too, though its also very frustrating in the way its so clearly FFXV: the abridged edition. Oh well. I like to think of it as FFXV: FF Versus XIII Salvaged Edition. Suikoden III: PS2Finally! It took almost 2 years to replay this SOB because my woman kept making me haul my box TV back to the garage when we'd have guests because it "looks ugly" and then I didn't want to setup again. This was my third run at the game and final since I had Geddoe be my FC. I only missed 16 characters without a guide and without trying so not too bad. It took me nearly 18 months to get through the first three chapters but once I got the True Fire Rune the game gets so much better so I raced to the end in a month or two (again, see above, this only took me a few weeks back in the day). Such a slow game at first, especially with SOOOO much backtracking, but the end is worth it. We have begun a new year! This means that this thread is now closing down. I have posted the annual statistics in the opening post, but I will include them here next to last year's statistics. It's not too late for me to update the 2016 list if anyone finished something in the last few days but does not regularly visit the site. However, this thread will be closed and considered final in one week. Once again, thank you everyone for another wonderful year of wasting time on a relatively expensive hobby! Love you all lots. I should perhaps report I beat the main story of Pokémon Sun for the 3DS a few days ago. I'll go into more details on my thoughts later, but it is a great improvement over X/Y, and perhaps even better Black/White. I need more time to mull over that. I really love the shake-ups to the formula! Thanks to you for your great work Clix and happy New year!! Thanks for the good work during your first complete season. I'm disappointed in my own contributions this year, but will hopefully step it up in 2017. Probably not, though, because Persona 5. My backlog has more to do with me playing lots of MMO's then playing my backlog.